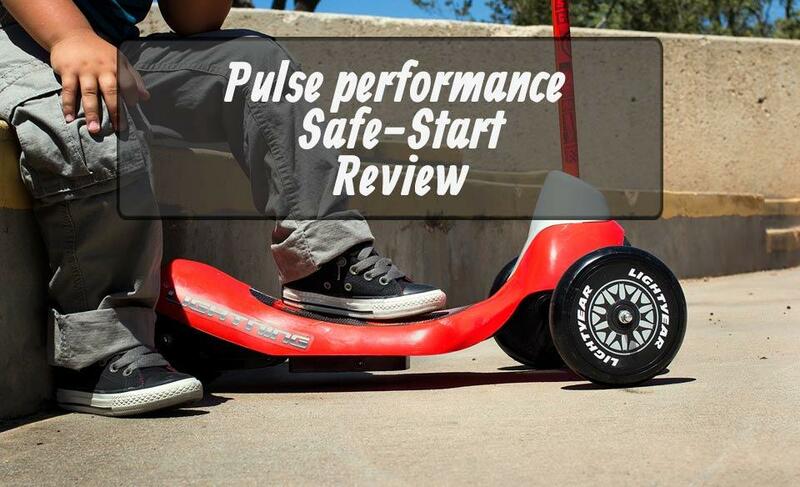 Today I thought we would have a look at one of the first electric scooters your kids should own, the Pulse Performance Product Safe Start 3-wheel electric scooter. It is built for the youngest riders in the family and it provides them with a safe and easy to learn scooter at the age of 2 and up to around 4-5 years of age. Electric rides are the future and this model provides them with a cheap introduction to the future of transportation. It has all the safety you could wish for as a parent and safe low yet fun top speed for kids at this stage in life. So what exactly makes it a good choice for your toddler? Keep on reading our review and riding experience section below to understand what our youngest thought about it and why I consider this one to be the superior choice. The Safe Start electric scooter is an electric scooter for toddlers. Even though the recommended age set by Pulse Performance is 3+, I would recommend you get this for kids as young as 2. I bought ours when my youngest boy turned 2 and he used it up until he was 4 years old. It has a top speed of 1.75 mph and is said to be able to take them on a 40-minute ride. It comes with a wide deck so that your kid can choose a standing position he/she is most comfortable with. The deck is low enough to make mounting and dismounting the scooter a breeze and they can easily jump off while riding if they start to lose balance. It utilizes a push-to-start button that will be very easy to learn and handle for your kid. *Depending on your kid’s weight and what type of terrain they ride on. Top choice for your toddler! The Pulse Performance Safe Start electric scooter provides your youngest with a smooth yet thrilling ride. It has a moderate 1.75 mph top speed and can run for approximately 30-40 minutes on a full charge. It gives them the freedom to ride at the power of their fingertips and you as a parent can breathe normally because this scooter is as safe as it gets! Lion Guard 6-volt electric 3-wheel scooter with easy control push button start Safe Start feature for smooth acceleration and deceleration, with speed safely limited to 1.75 mph Spacious 16" x 9" deck and a 42-degree range of steering ensures safe maneuverability 3 urethane wheels offer a smooth ride while the 3-in. low deck adds extra stability One full 8-hour charge provides 40 minutes of riding fun! Suggested for riders 3 and up, maximum weight of 50 lbs. The scooter is built for kids up to 3-4 years and after that, your kid will probably want some more speed and riding capabilities underneath their feet. 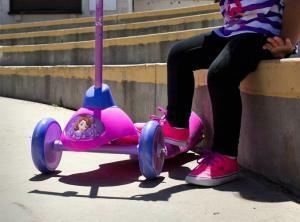 But for a 2 to 4-year-old this scooter is the best choice. It’s fast enough to be fun, but still at a low enough speed that you feel comfortable letting them ride it at this young age. It has oversteering protection and a push to start button that is easy to use for these young riders. It accelerates smoothly up to the top speed of 1.75 mph and my son had no problem riding it for 20-30 minutes depending on where he rode it. It does not handle inclines very well, even if its a minor one. The battery has a long recharge time but does provide a decent distance per charge. The wide wheelbase makes the scooter easy to use and keep balance on while riding. The wide base also makes it easy for them to find a good standing position. They can stand straight forward with their feet beside each other, or the more classic scooter stance which is one foot in front of the other while standing a bit sideways. I bet you most kids choose to stand straight forward just like mine did up to around 4 years. Other than that its one of the best models for the youngest riders of the family. Except for riding time, it does provide what is promised and I bet your toddler is going to love it just as much as mine did. A very smooth acceleration up towards the top speed. Available in a lot of different designs and colors. Oversteering protection so there are no accidental 180-degree turns. Wide wheel base that helps them keep their balance. Comfortable speed for a toddler and its parents. *These are my estimates from the last time my youngest son rode his safe start scooter. There aren’t a lot of electric scooters for toddlers to choose from. You have the safe start from Pulse Performance, and a new model from Razor called the Razor Jr. lil ‘E. Both are capable of providing a fun ride for toddlers age 2-4 but I consider the Safe Start to come out on top when it comes to both quality and performance. That’s why it’s taken the top position for toddlers on our best electric scooters for kids list. Do remember that after your young one hits 4 perhaps 5 years-old they will be wanting something with more endurance, strength, and speed to tackle a few hills and be able to accommodate their increased weight. Razor Pocket Mod Review - Who is it for and how good is it?